We’ve made it really easy for you to buy our music online. Choose from a real CD, or MP3 downloads. There’s nothing quite like the live sound of a Welsh Male Voice Choir. Fortunately, we’ve had the pleasure of being recorded by some very talented sound engineers over the years. We currently have two recordings available to buy online. Please note: When you buy our MP3 downloads, you will be taken to the site of your choice to process your payment. You’ll also be able to listen to samples of each track. Includes a selection of bilingual old favourites such as ‘Llanfair’, ‘The Lord’s Prayer’ and ‘Morte Criste’ as well as ‘Y Ddinas Ledrith’ (The Magical City) by Robat Arwyn. Would you like to buy “Music from the Vale” on CD? For a good old-fashioned CD copy, please click the Buy Now button below, to pay via PayPal. Once payment is received, we will post the CD to you. 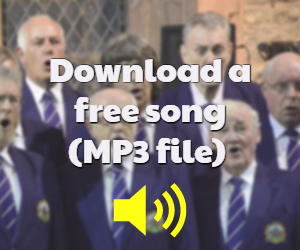 The wonderful evocative sound of a Welsh Male Voice Choir singing popular English and Welsh traditional and contemporary songs as well as some with a truly international flavour. Would you like to buy “Voices from the Vale” on CD? This was our first recording, on cassette. It is still available on cassette but we are currently looking into the possibility of releasing a digital version in CD format. Would you rather pay by cheque? Please supply the following information and send with your payment. Please add £1.50 for Postage and Packaging. Cheques to be made payable to Denbigh & District Male Voice Choir please.